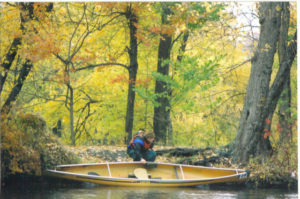 A yellow, curled up autumn leaf or a Kevlar canoe, both are more than capable of transporting a traveler and their imagination through the autumn scenery along the South Branch of the Raritan and reveal a glimpse of the hidden, natural world. The early morning October sun shown through the amber hull of my Kevlar canoe to resemble a bright yellow leaf with curled up edges that fell gently upon the water’s surface. It is easy to imagine sitting in that curled leaf, high and dry, while riding the river’s swirling currents. Witness the secret world of nature that shies away from sound and movement as you silently drift downstream. The leaf provides a cloak of near invisibility as you now become a spirit on a journey through the physical world. I set my Kevlar leaf upon the water and settled in to the sliding bucket seat with my hips and knees braced against the gunnels and held in place by the foot brace. I was now an integral part of the canoe, my slightest movement instantly transmitted to the hull. A single paddle stroke turned the bow into the current which magically spun the boat and took it downstream. 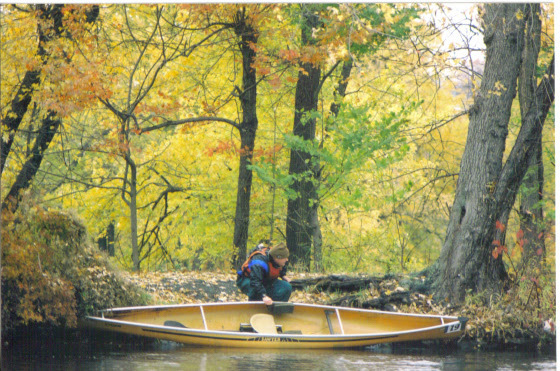 A draw stroke and a shift in weight against the hull and was enough to direct my yellow leaf on a journey thru the October scenery along the South Branch. 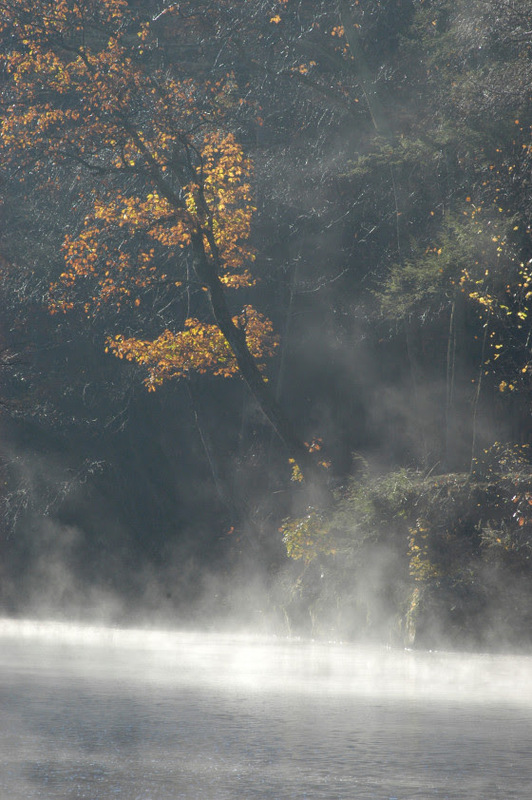 This morning, the brilliance of autumn foliage was muted by a fine mist rising from the river. Shafts of sunlight, however, gave a preview of the colors soon to be unveiled as the mist gave way to the bright, clear fall day. 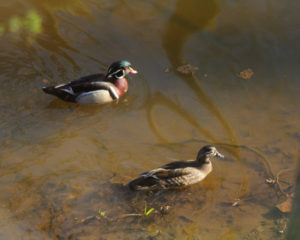 I soon spotted a pair of wood ducks nervously swimming in circles in an eddy downstream of a fallen tree. To get as near as possible for a photo, I kept the paddle in the water opposite the side of the ducks and used a figure eight movement to propel and steer the boat into position for the best camera angle. The boat drifted quite close before the pair of woodies flew off; when disturbed, they make an unmistakable, repetitive, two tone alarm call. The fast action framed by autumn color and blue sky, was over in seconds as the echo of their calls faded in the distance. What remained was an indelible image of these little birds gaining flight so quickly and flying full speed between the drape of overhanging branches, covered with orange leaves, and the calm reflective water of the eddy. Though a diminutive bird, the full range of motion of its wings barely cleared the passage between the trees and water. The tip of the longest flight feather, almost imperceptibly, left marble sized imperfections in the mirrored surface with each wingbeat as the birds disappeared in the distance around the curved riverbank. The river then straightened out to provide a wide angle perspective spreading out before me. The trees on either bank were ablaze in yellow, orange, red and scarlet, the color intensified by the position of the sun and a near cloudless sky of the brightest sky blue you can imagine. A rare white fluffy cloud, low on the horizon, stood in stark contrast against the celestial blue concentrate. To behold such a bucolic scene while riding on a magic carpet suspended on a river of energy within a kaleidoscope of color, mind and body enjoy a brief respite from thought, time and place. Several more miles downstream, my curled yellow leaf followed a deep channel along the high, red shale riverbank that gently curved to the left. The water, here, expressed deliberate intent as its energy flowed fast, allowing me to remain almost motionless. The hydraulic backwash on either side of the narrow channel kept the boat centered with minimal intervention from my paddle. 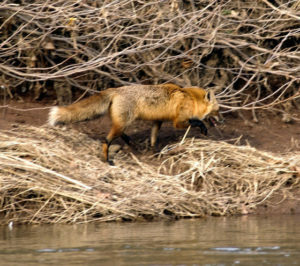 Ahead, a red fox walked along the steep bank at the water’s edge, apparently preoccupied with maintaining its footing. 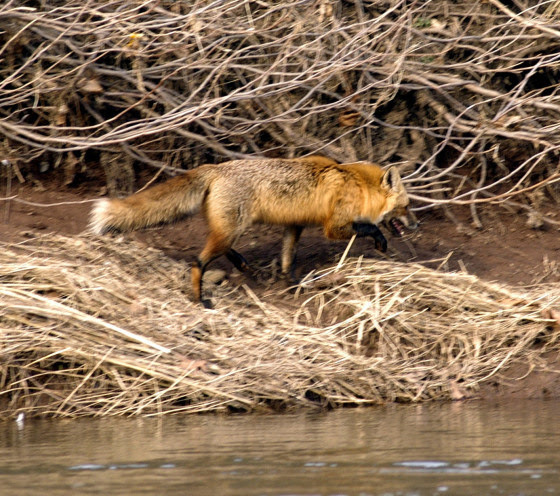 The angle of my approach and wind direction helped cover my scent and sound, allowing the fox to remain undisturbed. When I felt the fox’s field of vision was momentarily diverted, I would make a forceful paddle stroke to close the distance. Unbelievably, I was able to drift up behind and to the right of the distracted fox. 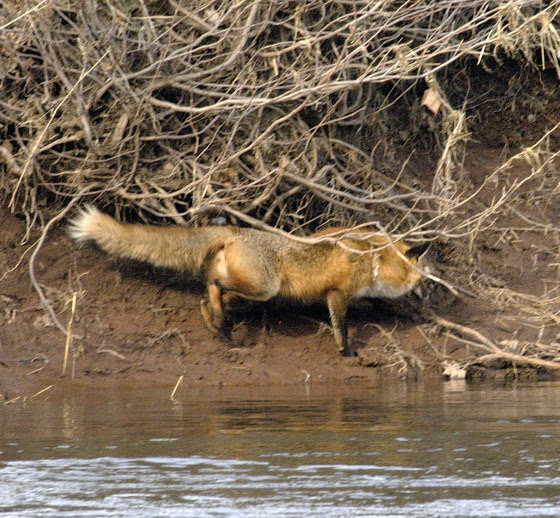 After several photos the fox realized it was exposed and tried to escape up and over the vertical bank. 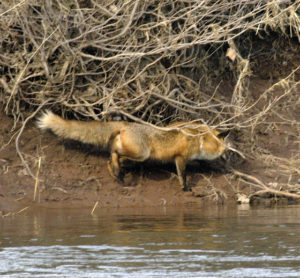 In its haste, the fox slipped and almost fell into the river. Momentarily stunned by the unexpected action and the current’s demand for immediate attention, the fox’s embarrassing moment was safe from digital publication. As a passenger on an imaginary floating autumn leaf, carried along by the energy of moving water, the next stop could be anywhere in the world where the sweet water of the South Branch flows. I chose, however, to get off in an overgrown pasture resplendent in autumn color, my yellow leaf turning back into a Kevlar canoe and a quarter mile uphill portage for which I had to supply the energy.